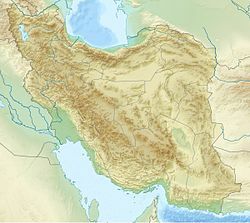 The 1721 Tabriz earthquake occurred on April 26, with an epicenter near the city of Tabriz, Iran. It leveled some three-quarters of the city, including many prominent mosques and schools in the city, and resulted in the deaths of tens of thousands of people. The total number of casualties caused by the earthquake is between 8,000 and 250,000; it was most likely approximately 80,000. At the time that it occurred, the earthquake was popularly interpreted as an omen of misfortune, or a demonstration of godly wrath. The destruction that the earthquake caused was a significant factor in the successful Ottoman takeover of Tabriz in 1722, as well as contributing to Tabriz's economic difficulties during that period. It also caused the destruction of some of the city's significant historical monuments. Accounts of the earthquake are often confused with descriptions of the 1727 Tabriz earthquake. ^ a b c d NGDC. "Comments for the Significant Earthquake". Retrieved 7 October 2012. ^ Hoseinpur, Maral; Zare, Dr Mehdi (2009). "Seismic Hazard Assessment of Tabriz, a City in the Northwest of Iran" (PDF). Journal of the Earth. Islamic Azad University, Northern Tehran branch. 4 (2): 26. ^ a b Matthee 2012, p. 223. ^ a b Gates, Alexander E.; Ritchie, David (2009). Encyclopedia of Earthquakes and Volcanoes. Infobase Publishing. p. 293. ISBN 978-0816072705. ^ Conder, Josiah (1830). Persia and China, Volume 12. J. Duncan. p. 193. ^ a b Werner, Christoph (2000). An Iranian Town in Transition: A Social and Economic History of the Elites of Tabriz, 1747–1848. Otto Harrassowitz Verlag. pp. 78–79. ISBN 978-3447043090. ^ Baker, Patricia L.; Smith, Hilary (2009). Iran. Bradt Travel Guides. p. 143. ISBN 978-1841622897. This page was last edited on 22 March 2019, at 19:13 (UTC).